Halee L. really knows how to ask the hard questions, doesn't she? Each person has to weigh this decision for themselves by knowing the facts. The Question: Is Grass-Fed Meat Really Healthier For You? My husband has recently been suffering from anxiety attacks. I have read that many types of meat can be beneficial for someone who suffers from anxiety. However, I also recognize that most meat is full of hormones and other potentially harmful things and that pasture-fed meat is best. We live in Mexico, and the only pasture-fed, hormone-free meat I have seen is chicken breast that costs about three times the regular chicken. So I've been asking myself, ‘Which is worse? Eating the meat that's full of nasties? Or eating little to no meat at all?' I truly believe that meat and the fat that comes with it is important to our diet. But I wonder how much damage standard meat is causing to our bodies. Any other tips you have concerning diet and anxiety are greatly appreciated. Thank you for taking time to read and answer questions! It is a blessing! Yes, grass-fed (also called pastured) meat really is better for you. Personally, I would choose to eat less of the good meat than eat more of the conventional meat. Finally, let's define what “grass-fed” means. “Grass-fed” means that the animal is raised on pasture and is not fed GMOs, hormones, antibiotics, or fattened up with grain. In other words, this way of eating is the God-designed diet and lifestyle for that animal. There are 3 big reasons why this kind of meat is the healthiest. When the animals feast on rapidly growing pasture, their fat (both in meat and milk) supplies high amounts of vitamin D, along with the other essential fat-soluble vitamins (A, E and K2). These fatty acids help regulate cellular inflammation, mood, behavior, and many other cellular functions. Now for the caveat, though. We need to consume these omega fatty acids in the optimal ratio. A ratio of 1:1 to 4:1 (that’s 1 omega-6 for every omega-3 to 4 omega-6 for 1 omega-3) is best. As the amount of omega-6 rises in relation to omega-3, unhealthy things start happening in our bodies. High omega-6 consumption, in relation to omega-3, strongly correlates to heart disease, inflammation, and hormone imbalance. Our family has personal experience with hormone disorders and acne related to a higher than desirable omega-6 ratio. Omega-3 is primarily found in pastured animal fats and wild fish. Omega-6 is primarily found in conventional meats and all nuts and seeds. If one if not careful, it's very easy to tip the scale toward omega-6. Recently, our family has been looking into hormones. I'm in pre-menopause and experiencing what's known as estrogen dominance. My estrogen levels aren't too high; rather, my progesterone is too low — common in aging women (and even men). This creates dominance rather than balance between estrogen and progesterone. Did you know that conventional meat, due to pesticide, antibiotic, and hormone use, passes on a class of estrogens called “xenoestrogens” or “xenohormones” to those who eat them? Xenohormones are found in dry cleaning chemicals, plastics, drinking water, cosmetics, personal care products, pesticides, herbicides, industrial chemicals, and… you guessed it, meat and dairy products from animals injected with antibiotics or hormones. So, what's the harm in this? Well… we absorb these estrogens through ingestion, inhalation, and direct skin contact. Therefore, absorption can lead to estrogen dominance — estrogen that's high in relation to low progesterone — or even outright high estrogen. As men age, both testosterone and progesterone levels decline together. When your progesterone gets low, negative symptoms can arise, such as poor sleep, fatigue, anxiety, weight gain, and lethargy. Since estrogen and progesterone are two hormones that work together in a ‘seesaw' effect, the result of low progesterone is a condition called ‘estrogen dominance'. Because conventional meat contains xenohormones (at least in the U.S.; I'm not sure about Mexico), it is not simply a neutral food. In other words, it's not just a case of “It's ok meat, I could do better, but this is all I can afford”. Instead, it's a case of the meat actually harming those with health issues — and creating health issues for those who would otherwise be healthy. Therefore, in my opinion, the hormone connection is just too strong to be brushed under the rug. Almost all meat in the United States comes from concentrated animal feeding operations (CAFOs). Animals raised CAFOs live in the most deplorable conditions — conditions that negatively impact our health, too. Because they are in such close quarters with other animals, and often without fresh air, clean water, and sunshine, these animals are more prone to sickness. As a result, antibiotics lace their food — which then end up in their meat. It was also discovered decades ago that small, daily doses of antibiotics caused the animals to gain up to 3% more weight than they otherwise would (source). Numerous studies show that the same antibiotics used to keep confined animals “unsick” make humans more sick — because these antibiotics affect the delicate flora in our guts (source). And if the use of antibiotics wasn't enough to turn you off of conventionally raised animal products, consider the diet of these poor animals*. In a CAFO, cows eat an obscure concoction of chemically laced corn and other grains — by-products from the production of ethanol and high-fructose corn syrup — and silage (source). The trouble is that cows aren't designed to eat grains, by-products, or silage. They are designed to eat grass. This unnatural diet produces a sick, nutrient-deficient animal, resulting in nutrient-deficient meat and toxic organs for you and me. It isn't as hard as it used to be to find local ranchers who sell far superior beef, pork, and chicken. They often give bulk discounts if you purchase one-quarter, one-half, or one whole animal. These ranchers are in control of the process from start to finish, so you should be able to ask for extras too, like bones, organs, and feet. *Do not eat the organs of conventionally raised animals ever, especially the liver, which must process the toxicity of the animals' environment. Halee, although only you can decide how best to proceed for your family and your husband, I personally think that eating less of the grass-fed meat (however much you can afford) is better than eating grain-fed meat at all. Make and consume broth — which is a “protein sparer” and helps you assimilate more of the protein you eat. Eat more pastured eggs if those are affordable for you. Look for the tough cuts of grass-fed and pastured meats and buy those. They could be less expensive than the conventional! See if you can buy direct from the farm or in bulk — you'll save a bundle! 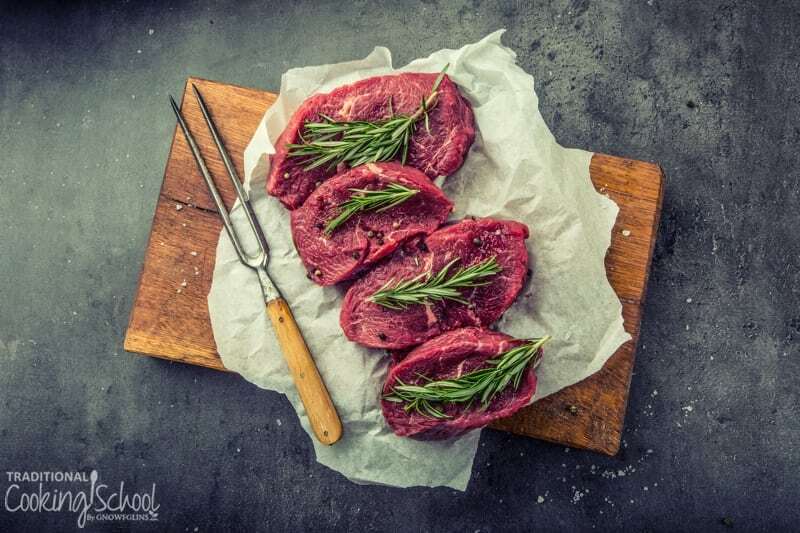 Order from a grass-fed supplier such as The ButcherBox! You'll save $10, plus get a FREE bonus and FREE shipping* on your first order! Or, order from a grass-fed supplier like Alderspring Ranch ($10 off first order with coupon TCSchool10) — they ship all over the U.S. and go through the extra step of dry aging their beef! *Free shipping for 48 contiguous U.S. states only. For our U.S. readers who may have trouble sourcing local grass-fed or pastured meats, I want to share a very special FREE offer from our friends at The ButcherBox. The ButcherBox is a subscription meat delivery service — bringing grass-fed and pastured beef, chicken, and/or pork right to your door for less than $6 per meal according to your schedule! It's quite amazing. We've received a few ButcherBoxes and enjoyed them very much. For a limited time, you can get $10 off + a FREE bonus + FREE shipping* on your first order with ButcherBox. You might be wondering how in the world this can be done? I mean, meat… delivered? Without spoiling? 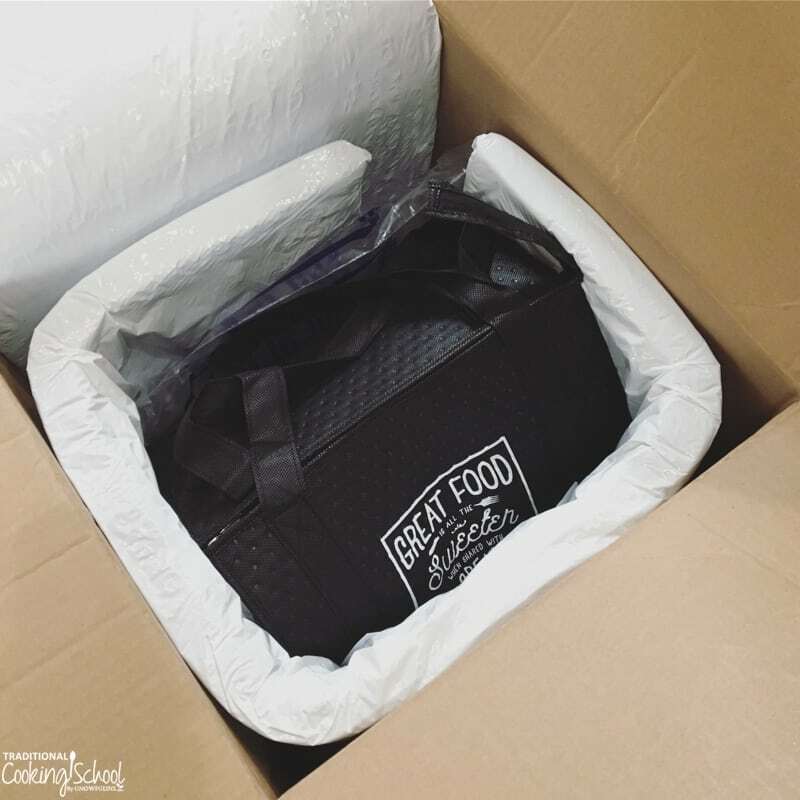 How it works is — they ship your order in a special box so it stays frozen all through delivery and arrives frozen. Your meat is packed inside the box in a (bonus!) handy insulated cloth shopping bag. Just open your box and transfer everything to your freezer, and you have quality meat for your meals. Click here for more information or to claim your FREE bonus plus get $10 off and FREE shipping* now! FYI: ButcherBox is a subscription service, and claiming your first order will automatically sign you up for the grass-fed and pastured meat delivery service. If you don't care for that or don't wish to continue — no worries, just cancel after claiming the offer. It's a really great offer so at least try it out to get the FREE bonus, $10 off, and FREE shipping! *Free shipping for 48 contiguous U.S. states only. New customers only. 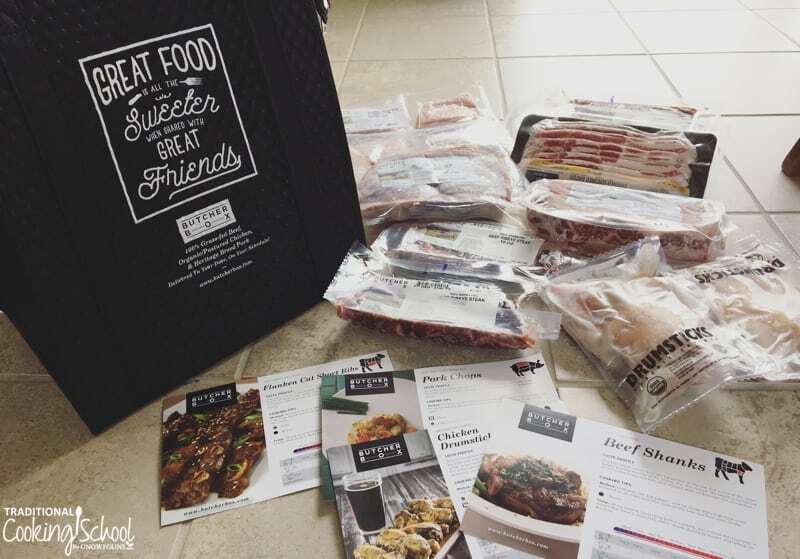 ButcherBox — Get $10 off + FREE bonus + FREE shipping — Hurry! Offer ends soon! Alderspring Ranch ($10 off first order with coupon TCSchool10) — they ship all over the U.S. and they dry age their beef! Does knowing the difference between grain-fed and grass-fed meat change the way you buy meat? I notice that most articles about the differences don’t address the way most people that raise their own beef do it, which is on pasture (hay in winter) with some grain on the side at different times, and a little more grain and maybe alfalfa hay in the last month along with the pasture. It’s not all one or the other, but most people out in the country find that the beef has a better flavor that way with some marbling, but still all the good grass and sunshine too. Everyone around here does that. No feedlot usually, tho some do bring them in for the last couple weeks or month into a pen if it’s late fall. This was so wonderful to watch and get some good facts on why buying grass-fed meat is so much better. I bought a organic grass-fed whole chicken yesterday for 24 dollars, and I couldn’t help but think how much more conventional meat I could buy for 24 dollars. But after watching this video, it just confirmed to me even more the importance of only eating grass-fed meat. I’d rather eat less meat and spend more on it than to eat meat that is harmful for me and my family. Thank you! 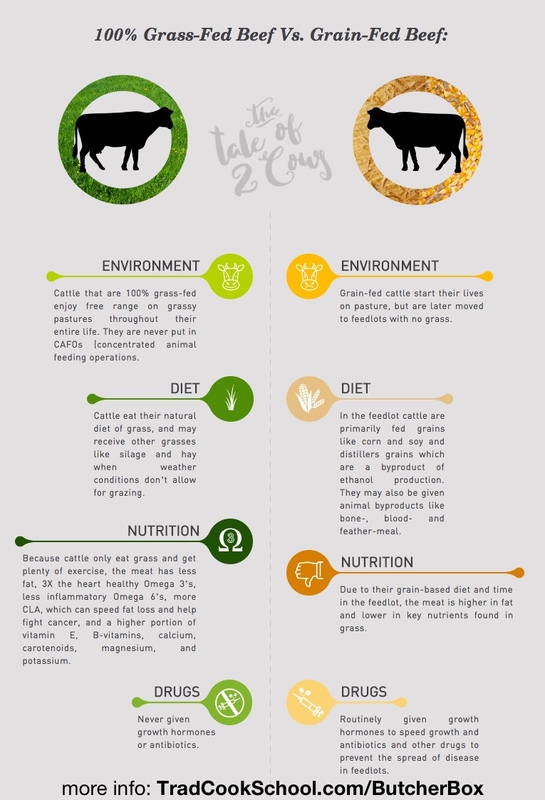 There is a difference between 100% natural Grass-fed meats and Grass-fed/Grass-finished meat. Two butchers at my local Whole Foods grocery store told me that – but only the grass-fed/grass-finished are not given some grain. The grass-fed designation can be given to meats that are started with grass and then finished up with grain to add additional fat and flavor. FYI: By law, unless it is organic, extremely young poultry are allowed to be given antibiotics, and then no more antibiotics are allowed by law with poultry. I learned this fact in a class about food and health that I took in order to renew my RN licensure. I did not believe it, as all poultry in the US states “no antibiotics” – so I went o- line to do further research and learned that extremely young poultry are given a small amount of antibiotics unless they are labeled organic.